In a straight shootout between the dozens of Space Invaders variants of the late 70s/early 80s, Galaga was and always will be king. As one of the few classic arcade era games that still feels as exciting to play today as it did back then, it's hardly surprising that Namco feels compelled to continually recycle its seminal shooter. 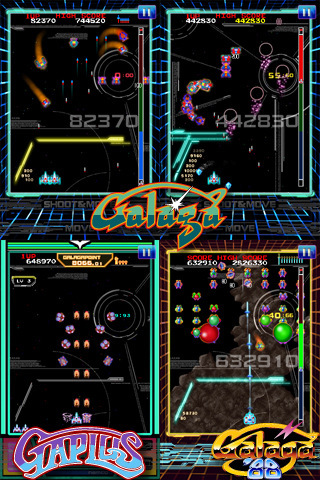 But while the recently released XBLA title Galaga Legions DX provided a turbo-charged 30th anniversary tribute, this four-title retrospective (including Galaxian, Galaga, Gaplus and Galaga '88) offers a more faithful and conservative attempt to bring matters up to date. Central to the changes are the new weapon system. Rather than having to painstakingly unleash your limited firepower at the massed ranks one at a time, all four games now sport a rechargeable rapid fire system. Needless to say, this instantly changes the gameplay dynamic from a probing, patient style to one that's more fast and furious, and with the balance of power firmly shifted in your direction, levels come thick and fast as you cut a swathe through your enemy's feeble defenses. Old school fans will almost certainly consider this sacrilege, but you get the distinct impression that this isn't for them. Perhaps this is a gateway for people who enjoy the idea and aesthetic of retro gaming, but can't be arsed with all the pain and suffering that generally accompanies it. For that audience it might be a worthy exercise, and the accumulation of redeemable 'Galaga Points' to make matters even easier won't seem like a terrible idea at all. With extra ships, increased bullet count, quicker reload speed, armour, and new skins laying in wait, your leaderboard position can always be improved with a little help. Taken at face value, these 'remakes' aren't as disastrous as they sound, but not including the original versions alongside them guarantees a testy dismissiveness among the very people who would champion this collection the most. Requirements: Compatible with iPhone 3GS, iPhone 4, iPod touch (3rd generation), iPod touch (4th generation), and iPad. Requires iOS 4.0 or later. What's Hot: New rapid fire system, leaderboards, cool power-ups, old school graphics. What's Not: Does not include arcade originals, you must purchase additional games.